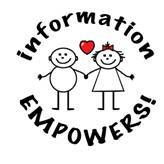 Information Empowers! started in 2001 as a research project. This project was focussed on child safety and the prevention of child sexual abuse; and to gain knowledge and to teach children about the dangers involved. A Group of passionate and dedicated professionals, some of whom are parents, have volunteered their time to assist with Information Empowers! and the fight against child sexual abuse. · Not enough information is available to people and their children to confidently educate themselves about child sexual abuse and basic safety. · The information available is written mostly in academic terms. · People at grassroots level have indicated that information such as we have developed, is of extreme value to them as sexual abuse happens daily. · Professionals who assist children and their families in communities where child sexual abuse is rife, have indicated that more information is needed in communities. · Counselors and members of Victim Empowerment Groups have little access to information written specifically for children. The need to educate children from a young age is recognised. We would appreciate your input and feedback and would like you to email us with questions, comments or suggestions.